The Board of Directors may appoint one or more District Deputy Presidents General, who shall watch over the interests of the State Societies in their respective districts and shall be ex-officio members of the Board of Directors, provided, however, that the General Society may, if it sees fit, elect such deputies and assign their districts. When an officer of the General Society has served (continuously or otherwise) in one or more of the offices named in Article III for not less than nine (9) years he may, at a meeting of the General Society, be elected to bear during his life the emeritus title of any office in which he has served in the General Society. The Secretary of each State Society shall transmit to the President General, Secretary General, Treasurer General, and Registrar General copies of a list of the members thereof, together with a list of those from whom said members derive claim to membership, and thereafter, upon the admission of additional members the Secretary thereof shall transmit to the General Society such similar information respecting said members. Each State Society shall pay into the treasury of the General Society such sum annually as may be fixed by the Board of Directors for each and every member in good standing on the rolls of each State Society, so reported on 1 January of each year; provided, the per capita fee of dual members shall be paid by the primary State Society of the member and the member’s name listed as a primary member when per capita fees are paid to the Treasurer General, and provided further that dual and non-dual memberships are to be determined by each State Registrar using the coding of General Society numbers as established by the Registrar General. All official listings must identify primary and dual members. Any State Society that is delinquent in the payment of its per capita fee shall not be entitled to vote in any meeting of the General Society. Be it known that _______________________________________ has been duly admitted a member of this society in right of the services of his ancestor ___________________________ (from whom he is __________________ degree in descent), in the War of 1812 for American Independence. this ____________________ day of ________________________ in the year of our Lord two thousand and __________________________________, and of the Independence of the United States of America, the two hundred and _________________________. Section 1 – Standing committees shall be appointed by the President General. Section 2 – Special committees may be appointed by the President General as directed by the Board of Directors. The Board of Directors shall have the power to drop from the roll the name of any enrolled member-at-large of the General Society who shall be at least one (1) year in arrears of dues and who, on notice to pay the same, shall fail and neglect to do so, within thirty (30) days thereafter, and upon being thus dropped his membership shall cease and terminate; but he may be restored to membership at any time by the Board of Directors and his application therefore, and upon his payment of such arrears and annual dues as the Board of Directors deems proper. No State Society shall have power to involve the General Society in any pecuniary obligation whatsoever, nor in any controversy with any other State Society. The customary law of the General Society as manifested in its traditions and precedents and in such resolutions as shall be adopted by the General Society or the Board of Directors shall be recognized as governing the acts of the Society in lieu of specific authority of the General Society’s Constitution and By-Laws. 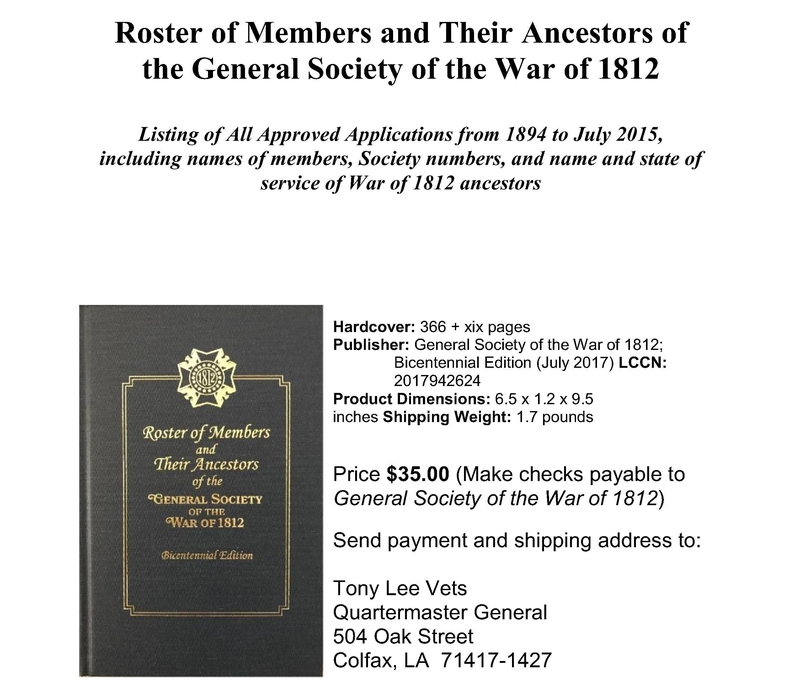 When a State Society-in-formation has enrolled a minimum of ten (10) members as either members-at-large or current members of State Societies, it may submit a petition for a charter to the Secretary General for consideration at a meeting of the General Society or the Board of Directors. Names of the petitioners shall be listed in order of admission as Charter Members to establish a sequence of State Society membership numbers. The General Society, when a petition for a State Society has been approved, shall present to said State Society a suitably engrossed charter which shall contain the names of the Charter Members. If the State Society for any reason be dissolved the charter shall be surrendered to the General Society. The procedure for amendment of the By-Laws shall be the same as stated in Article X for the amendment of the Constitution. I certify that this is a true and correct copy of the Constitution and Bylaws of the General Society of the War of 1812 as amended through the Triennial Meeting held on September 8, 2017 in Plattsburgh, New York. This document consists of twelve (12) numbered pages.